What is R Programming ? R programming language was created by Robert Gentleman and Ross Ihaka at University of Auckland, New Zealand. R is a software environment for graphics representation, statistical analysis, reporting. R Programming language is currently developed by R Development Core Team and it is freely available. R programming is used in many large companies such as Google, Airbnb, Facebook, Uber, etc. Why KaaShiv InfoTech Company to learn R Programming Training in Chennai? Kaashiv provides Best R Programming Training in Chennai with professional trainers who provide real-time training and also projects to the candidates for better understanding. 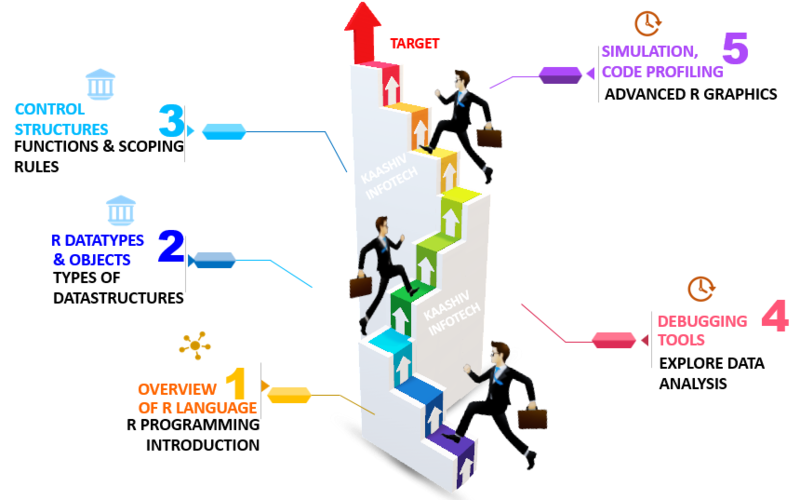 Why Students Enroll for real time R Programming Course ? The R software supports users range from 250000 to 2 million. Data analyst should have basic knowledge in R language. It is widely used in big organizations like IT, Retail, Pharma, Logistics firms, Healthcare, Supply chain. In a short period, large datasets can be analyzed using R programming. Students from 1stYears /2nd Years / 3rd Years / 4th Years / Passed Outs / Freshers and Professionals interested to learn. For R Programming Training 80 concepts from Basic to Advanced will be covered.